Several years ago, Course Crafters published a successful e-newsletter for educators called The ELL Outlook. We’re making some of the most popular articles available free here, which include insights on reading research and ELLs, formative assessment, and more. Check this site regularly to see new articles and blogs by Lise Ragan and guest bloggers, on topics such as ELLs as Assets, ELLs and the ESSA, What’s Needed for Professional Development?, Funding and ELL Education, Effective Sustainable EL Family Engagement, and The Changing Face of Bilingual Education. If you’d like to suggest a topic, email us. So if you’re a teacher of ELLs, you have no time, no materials, and no professional development. Now you find that you also have students at various levels of language proficiency and academic achievement in your classes. At this point, you must surely be wondering what ever made you want to be a teacher. Is there room for dual language learners in the new administration’s vision for the country? What place will the millions of students in our country who come from homes in which a language other than English is spoken have going forward? I recently attended a webinar sponsored by TESOL, “An Overview of the Every Student Succeeds Act: What TESOL Educators Need to Know”, which was an overview of the ESSA and the implications for states, schools, and districts that enroll English learner students. The ESSA, signed in December 2015 by President Obama with bipartisan support, greatly decreases the role of the federal government in K-12 education and moves authority and responsibility back to the states and local education agencies. So knowing the implications of the ESSA for ELs in the states is critical. In August 2014, the Council of Great City Schools published their Framework for Raising Expectations and Instructional Rigor for English Language Learners, which I and Course Crafters use as a guidepost for designing curricula and instructional materials for ELLs and their teachers. 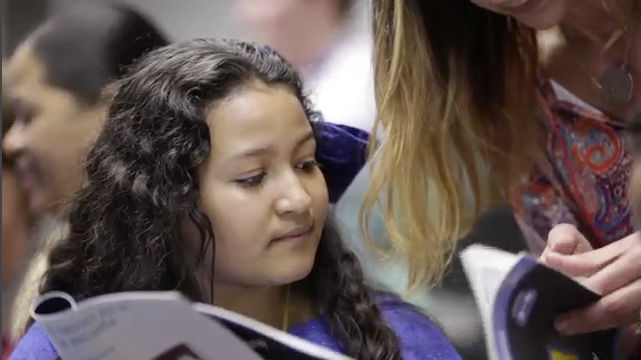 The Council of Great City Schools has a huge stake in the academic success of ELLs: their 67 school districts collectively enroll over 1.2 million of the country’s ELLs, or 26% of the nation’s total. After NCLB, and now reiterated in ESSA, all ELLs, K-12, are held to the same rigorous academic, college- and career-ready standards as their English-proficient peers. Helping school districts meet this goal requires those of us who design curricula and instructional materials for ELLs and professional development for teachers of ELLs—language educators and, increasingly, mainstream classroom teachers—to reexamine the way we are looking at developing ELLs’ academic language proficiency. We’re not there yet, but we’ll get there if we examine and pay heed to the suggestions in the CGCS Framework. As a classroom teacher, I was largely ignorant of, and definitely suspicious of, research. I believed that researchers could make their studies come out any way they wanted them to, and that a good teacher who reflected on her own teaching knew much more about how to be effective with her students than any researcher did. Later, as a university professor, I learned how important good research can be, and how difficult it is to do really good experimental research in a field such as education, where it is impossible to control all the variables.